Espoo, Finland - June 5, 2007 - Futuremark Corporation, the world's leading provider of PC and mobile phone performance analysis software, and services announced today the appointment of Mr. Tero Sarkkinen as CEO, effective July 1st, 2007. Currently overseeing the company's worldwide sales and marketing, Mr. Sarkkinen has worked the past 7 years directly with Mr. Risto Vehvilainen, Futuremark Corporation's current CEO. Mr. Vehvilainen enters retirement on June 30th but will continue to contribute his expertise and contacts tothe company as a Director on Futuremark Corporation's board. Mr. Vehvilainen is widely credited for transforming Futuremark into a rapidly growing professional organization. Under Mr. Vehvilainen's leadership, Futuremark has reached and maintained consistent profitability, with the company experiencing significant advances in their PC and handheld performance benchmark segments and in their fast growing online publishing business. Futuremark lists 35 top tier customers from Asia, Europe and the US in their various benchmark development programs (BDP) and sells software and services to hundreds of semiconductor and hardware companies around the world. The company employs a highly skilled staff of 64 in the US, UK and Finland, with deep proficiency in developing performance measurement software and services for PC and handheld markets. In April 2006, Futuremark Corporation was a recipient of "Red Herring Hot 100 Europe," a selection of the top 100 private companies based in Europe that play a leading role in innovation and technology. 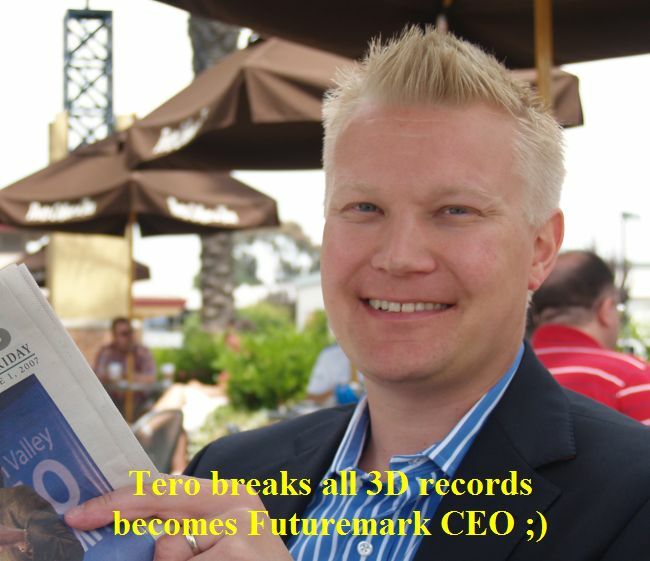 Mr. Sarkkinen said: "I'm humbled and at the same time very excited to lead Futuremark to the next stage. Risto Vehvilainen has done an unbelievable job in guiding Futuremark from its challenging past into the present day's company, which has earned the respect and business of its numerous top tier customers." Sarkkinen's transition to the role of CEO has been well planned for and is a natural evolution from his previous positions as Executive Vice President Sales and Marketing, and President of Futuremark Inc., Futuremark Corporation's US subsidiary which he incorporated in 1999. Sarkkinen will relocate to corporate headquarters in Espoo, Finland. With Sarkkinen's move, Mr. Oliver Baltuch has been elected President of Futuremark Inc. and in that role will oversee Futuremark's North American operations. "Futuremark Corporation has found success by focusing on its core assets and talents, and securing a promising market for their offerings with influential PC and handheld industry customers and partnerships," said Mr. Artturi Tarjanne, Chairman of the Board of Futuremark. "Risto has set Futuremark on the path for success, and Tero possesses the talent, skill and drive to steer Futuremark to the next level."